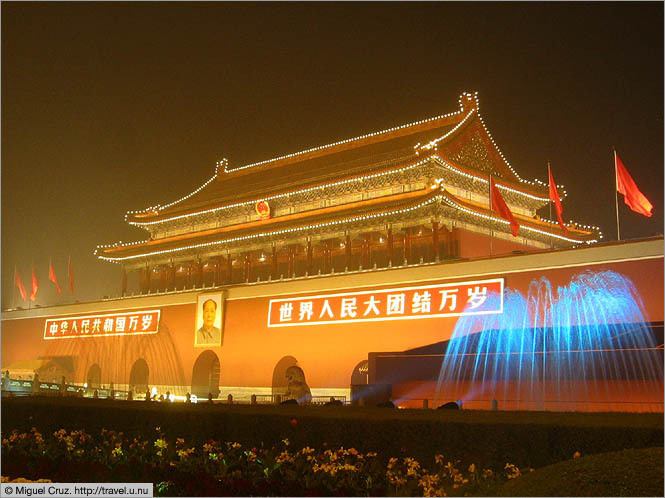 I don't really have any scenic photos of Tiananmen Square itself, because I don't think it can be done. The square is so vast, and the air quality so bad, that it's pretty much impossible to see from one end to the other. But even without a photo, you can imagine it pretty easily. Basically, picture all 1.2 billion Chinese people milling around in a square so immense that they handily fit, with room to spare. In addition to all the milling, they laugh at how tall I am (what do they do when I'm not around? ), and take turns photographing each other in front of a giant Lego spaceship that I think is meant to symbolize China's upcoming failed attempt to land on the moon by 2010.